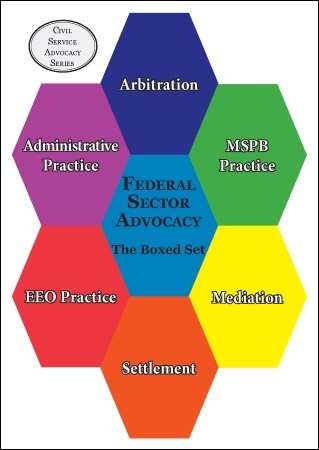 Federal Sector Advocacy: The Boxed Set - Dewey Publications Inc.
Peter Broida presents this video training course on federal sector arbitration. Major advocacy topics include common and dissimilar elements, including jurisdiction, among the MSPB, EEOC and arbitration; basic case preparation and organization, discovery, summary judgment, settlement, prehearing procedures and preparation, the hearing, closing the record, and appeals. Peter Broida presents this video training course on MSPB Practice. Major MSPB advocacy topics include organization and jurisdiction of the Board; developing the record; litigation management; appeal timeliness; gathering information; MSPB appeals process; motions practice; discovery; prehearing orders, submissions, conferences, and summaries; cases decided without a hearing; hearing preparations; hearings; petitions for review and judicial review; and settlement. Gary Gilbert and Peter Broida provide intermediate to advanced level instruction for agency practitioners on the practical points of representation of federal agencies in the EEO process. They discuss the proper role of counsel during the EEO counseling and investigation process; discovery; motion practice; effective summary judgment submissions; approaches to settlement; hearing preparation, practice, and procedure; examination of witnesses; opening and closing statements and briefs; OFO appeals; and interaction with judges, opposing counsel, and pro se complainants. Peter Broida presents this video training course on federal sector mediation. Major mediation topics include: issues amenable and not amenable to mediation; reasons to mediate; preconditions to settlement; traits of a good mediator; sources of mediators and mediation programs; mediator selection; mediation structure; preparation for mediation; the mediation process step-by-step; development and review of settlement agreements; and keys to effective mediation. Also includes, in .pdf format, The Advocate�s Practical Guide to Using Mediation by John Settle. Peter Broida presents this video training course on settlement of federal sector personnel cases. Major settlement topics include the basic components of an agreement; settlement notebook; checklist for a typical settlement of an adverse or performance based action; and settlement formalities. A total of approximately 19 hours of instruction, principally intended for agency advocates, but useful as well for union and private sector representatives.